There's the hands-free Cube, a powerful streamer box, and cheaper streaming sticks. All offer access to thousands of apps and games, and almost every streaming service you could want. Amazon has just released its own DVR called the Fire TV Recast too. We've tracked down the top Amazon Fire TV prices for all of the devices to avoid you getting burned by a bum deal. You may be surprised by how little these exceptionally versatile little gadgets cost. But why choose an Amazon Fire TV over something like a Roku? Many like the simple interface of Roku, but Amazon lets you play with far more apps and games because it's based on Android. The Fire TV in particular can feel a little like a casual game console, if you want it to. Like Roku’s top-tier player, both the Amazon Fire TV Cube and new Fire TV Stick offer full 4K resolution. Currently only available in the US. Amazon has just released its own DVR (Digital Video Recorder) to record free over-the-air content and watch it via an Amazon Fire TV device or Echo Show (so you'll need one of those too). There are no subscription fees here, so it's a tempting option for all you cord cutters out there and with a 500GB capacity on the cheapest model, you're looking at around 65 hours of storage, so there's no need to pick up an external drive to save content, which is an issue with some DVRs. There's a larger 1TB capacity version if you want to double down. Hook it up to a HD antenna and you'll be able to watch and record content from the likes of ABC, CBS, FOX, NBC, PBS, and The CW. Better yet, just ask Alexa to do it for you if you've got a modern Fire TV device with a voice-remote. Amazon just unveiled the latest edition of its Fire TV Stick, and it's a doozy. The new streaming media stick packs a wealth of features into a thumb-drive sized stick while retaining a low sticker price. For not much more than the older edition Fire TV Stick, you get 4K capability, HDR, 802.11ac Wi-Fi, a 1.7GHz quad-core processor, and Dolby Atmos Audio—something very few streaming sticks have. Plus, you also get Alexa, Amazon's smart assistant, and its voice control capabilities. Currently on available in the US. Released in June, Amazon's new Fire TV Cube is a hybrid between a smart speaker and a streaming media player. Calling itself the “first hands-free streaming media player with Alexa”. Amazon seems to be betting on this combined functionality to sway consumers away from rival Chromecast or Apple TV devices. The Cube comes with its own Ethernet port, 16GB of storage, and a built-in speaker, circumventing the need to use a TV's audio output. Users are also be able to control other compatible smart home devices, including additional speakers, soundbars, thermostats, and security cameras. The new Amazon Fire TV (2017) is a radical redesign of the Fire TV range, both inside and out. It's been turned into a dongle but also given a huge power boost. Its 4K credentials have also improved with the addition of HDR and it's always great to see Dolby Atmos getting some love. 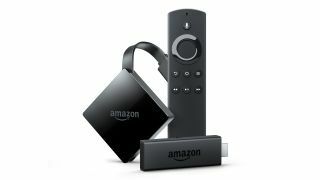 The new dongle is worth the upgrade for brand-new Amazon Fire TV buyers because it combines the best of the old hardware – it's just as powerful as the full-size box, but it's smaller in order to sneak behind your entertainment center without drawing attention.